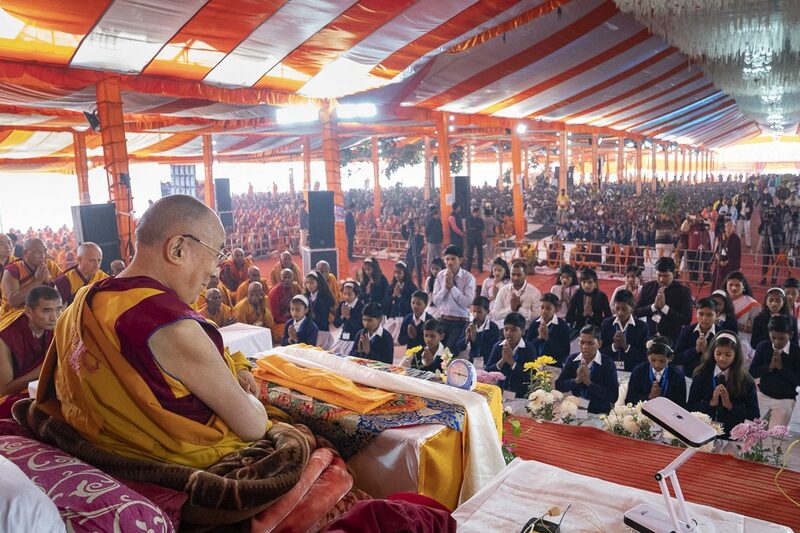 (TibetanReview.net, Dec04, 2018) – The Dalai Lama on Dec 3 began three days of religious teaching in the ancient Indian city of Sankisa in Farrukhabad District of Uttar Pradesh state. He has been invited by the Youth Buddhist Society (YBS) of India and the teaching is on Shantideva’s A Guide to the Boddhisattva’s Way of Life (choejug). More than 15,000 devotees, the vast majority of them Indian Buddhists, are attending the teaching being given on the YBS ground. Sankisa is counted as one of eight major Buddhist pilgrimage places in India. Buddha Shakyamuni is believed to have returned to earth here after spending a rainy season teaching in the Heaven of Thirty-three, where his mother had been reborn. The site was identified and marked by Emperor Ashoka who had a pillar erected here, topped by an elephant capital. It was said to have been visited by the Chinese Buddhist monks Faxian and Xuanzang in the 5th and 7th centuries CE. The site was rediscovered in 1842 by General Sir Alexander Cunningham after a long search. The Dalai Lama last visited the place and gave a teaching in 2015. YBS is a people’s development movement based on engaged Buddhism and was established in the city in 1986.